Red light therapy devices work by boosting overall cellular energy, increasing the production of collagen, elastin, which at the same time results in more microcirculation. Red and Infrared light are therefore quite suitable to apply at areas of pain. That's why people also talk about it as a LED pain reliever. Light therapy will also improve the health of people who suffer from pancreatitis or insulin dependent Type I diabetes, by forcing the pancreas to make insulin. Therefore, if this condition applies to you, be sure to consult with your doctor. Below you can find information about light therapy for pain relief devices, such as TenDlite, AAH Light, Quantum QR1, Quell, DPL Flexpad, and more... Maybe you also want to know more about Infrared light for pain relief , its wavelengths, devices etc..
Red Light for Skin Care. The pain relieving red light devices mentioned here, are not meant for skin care treatments at-home as some people may think. 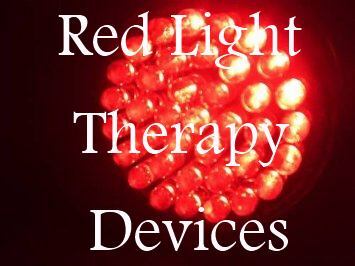 For these purposes see here red light therapy devices for skin care and anti-aging. You'll find below well-rated red and/or infrared light devices for pain relief. Images below may lead to webpages for more information, or to Amazon where you can read through the reviews which is quite informative. Anti-Inflammatory & Analgesic LED light device for your joint pain relief. According to the company, with their red light device healing goes faster and stronger as it increases joint's collagen production which leads to tissue repair. I see many online comments from users saying they're very satisfied about relieving their pain with this device. They use it for pains such as knee pain, shoulder pain, back pain, hip pain, rheumatoid / arthritis pain, carpal tunne (canal) inflammation. It uses the Red led light wavelength of 660 nm (nanometer) at a power output of 1500 mW, so it is quite powerful. For this great-rated and popular TenDlite red light therapy device, and how it works, Read more in a Tendlite Review. The AAH Light device is equipped with red LED light to relieve pain, inflammation, wound healing and acute/chronic symptoms. The device is used to relieve pain at human body parts and is also quite suitable to apply on animals. This device might be quite beneficial to you when dealing with injury healing, bacterial infections and eradicate fungal, or want to treat pain/inflammation in lower back, hip, knee, shoulder, neck or other body parts. It uses the Red led light wavelength of 660 nm (nanometer). Featuring 3 power output settings: 100 mw, 250 mw and 500 mw, so you don't need separate devices for each of these power outputs. The 100mw power output is effective for all circumstances, while the higher setings are better for deeper and faster penetration. Another feature is that the red light head is interchangeable with other light colors for different treatments. For this well-rated AAH light device, see Amazon Here for best pricing, info and reviews. Video on the AAH Light device. This Quantum device for tendon and joint, automatically delivers timed one-minute doses of light, to reduce pain and inflammation, and improves blood circulation. This well-rated Quantum QR1 device features a high-powered 660nm Red LED light(US-made) and a 1-minute timer. It is also suitable to use for your pet. Manual, charger and pretective glasses come with this device. For this Quantum QR1 device, see Amazon Here for best pricing, info and reviews. The RxED supplier sees their 660nm Red LED light therapy device as somewhat equal to the other red LED light therapyu for pain relief devices: TendLite, Quantum and AAH Light. The supplier describes the RxED device as "Turbocharged - Lighting Module uses a High Quality, Domestically Produced 660nm Philips Luxeon LED, powered by a special high efficiency digital Constant Current circuit, which maintains long lasting maximum Light Output without dimming during use. Our combination of correct Wavelength and Intensity maximizes Brightness and Penetration and ensures optical characteristics essentially identical to those used in many NIH Red Light Therapy protocols." The device comes with battery, USB charger/cable, goggles, carry holster and directions. If you're looking for a really affordable red LED light device for pain relief, you might try the RxED. It features a 60-days money-back guarantee for a no risk evaluation. What I like best about this device is its price and the 2 year lighting module warranty. For the RxED red LED light device, see Amazon Here for best pricing, info and reviews. For pain relief infrared heat devices such as Beurer IL50, UTK Jade Mat, TDP Lamp Floor Model KS 9800, see Infrared Light for Pain Relief. Quell Pain Relief Wearable Device. Can be handy this Quell pain relief wearable device. Read more about this popular Quell system. Traditional Moxibustion treatment application in a new way. Temperature and fan control technology for inner thermal microcirculation is used to gather heat quickly to cater physiological conditions. Mox disks emit smokeless scented herb smell after heating. Moxibustion treatments has been applied for thousands of years in Asia. To read more about the Mechanism of Moxibustion, see this Ancient Theory and Modern Research artcle. It is applied for a lot of different pains and illnesses. It may help you when suffering from Dysmenorrhea, gynecological inflammation, sports injuries, rheumatism and joint pain, neck fatigue and pain; Headaches and insomnia, gastrointestinal weaknesses, diarrhea, constipation; hypertension, hyperlipidemia and varices. Just apply the device on the pain spot. The device comes with a manual and 40 Moxa disks. For this pain relief Moxibustion Red LED Light Therapy and + Aromatherapy Han-Moxa, see Amazon Here for best pricing, info and reviews. The light therapy device is equipped with 81 red LEDs. At their specific 633 nm wavelength they increase local blood circulation, which promotes healing of joint and muscle tissues. It also soothes away inflammation and reduces swelling. It may help you against arthritis stiffness, joint & muscle soreness and muscle spasms. For this good-rated Medlight 630 Pro Red Light Therapy device, see Amazon Here for best pricing, info and reviews. If you want relieve of arthritic pain, muscle and joint pain, and reduce inflammation and stiffness, you might be well served by this handheld light therapy device. You also increase blood circulation, speed healing, and diminish bruising, according to the LightStim company. For this well-rated LightStim handheld to relieve pain and more, see Amazon Here for best pricing, info and reviews. This is a multi-functional device to relief several kinds of allergies. So if you suffer from hay fever - seasonal allergic rhinitis - , nasal itching, congestion, sneezing, snoring, runny nose, watery eyes, etc. this device might be worth trying to relief your allergy. The red light makes that cells produce less histamine, which causes symptoms of hay fever. For this well-rated Allergy Reliever, see Amazon Here for best pricing, info and reviews. An additional help or alternative for certain pains might be a TENS unit.